^ 1.0 1.1 Akbar (Mughal emperor). Encyclopedia Britannica Online. [18 January 2013]. ^ Famous Birthdays on 15th October. [October 21, 2012]. ^ Akbar I. Encyclopaedia Iranica. 2011-07-29 [2014-01-18]. ^ Akbar I. Oxford Reference. 2012-02-17 [2014-01-18]. ^ Day, Upendra Nath. The Mughal Government, A.D. 1556-1707. Munshiram Manoharlal. 1970: 134. ^ Dasgupta, Ajit Kumar. History of Indian Economic Thought. Routledge. 1993: 45. ISBN 0415061954. Chandra, Satish. History of Medieval India. New Delhi: Orient Longman. 2007. ISBN 9788125032267. 秦颂 编著. 世界上下五千年. 北京出版社. 2006. ISBN 9787200065138. Henry Beveridge (Trans.) The Akbarnama of Ab-ul-Fazl Bibliotheca Indica Series (Calcutta: Asiatic Society of Bengal) 1897 Three Vols. Pierre du Jarric, Akbar and the Jesuits, London, 1926. John Correia-Afonso, Letters from the Mughal court, Bombay, 1980. Augustus, Frederick; (tr. by Annette Susannah Beveridge). The Emperor Akbar, a contribution towards the history of India in the 16th century (Vol. 1). Thacker, Spink and Co., Calcutta. 1890. Augustus, Frederick; (tr. by Annette Susannah Beveridge). Gustav von Buchwald, 编. The Emperor Akbar, a contribution towards the history of India in the 16th century (Vol. 2). Thacker, Spink and Co., Calcutta. 1890. Malleson, Colonel G. B. Akbar And The Rise Of The Mughal Empire. Rulers of India series. Oxford at the Clarendon Press. 1899. Garbe, Dr. Richard von. 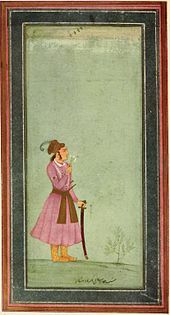 Akbar - Emperor of India. A Picture of Life and Customs from the Sixteenth Century. The Opencourt Publishing Company, Chicago. 1909. Havell, E. B. The History of Aryan Rule In India from the earliest times to the death of Akbar. Frederick A. Stokes Co., New York. 1918. Moreland, W. H. India at the death of Akbar: An economic study. Macmillan & Co., London. 1920. Monserrate, Father Antonio. The commentary of Father Monserrate, S.J., on his journey to the court of Akbar. Oxford University Press. 1922.